Tensions continue to build in The Bunker in the wake of Rory Regan's departure. Things get worse when an attack on Star City Hall reminds Rene Ramirez of the family he lost and why he became a vigilante. 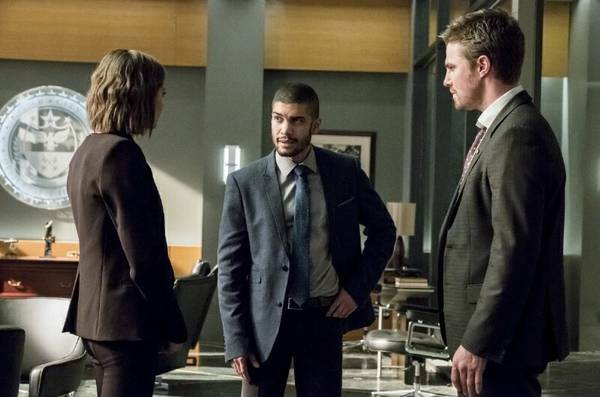 Meanwhile, Oliver works to identify the attacker and realizes that this may be a job for Mayor Oliver Queen to solve rather than The Green Arrow. The comics of John Ostrander (particularly Batman: Seduction Of The Gun) and the Green Arrow comics of Elliot S! Maggin (particularly What Can One Man Do?). Oliver Queen dealing with the political and social ramifications of an act of injustice fit neatly into the oeuvre of both writers. After two hours of trying to find specific numbers matching the statistics quoted by various characters in this episode, I decided not to bother. It's a different universe so the statistics regarding the ineffectiveness of federal assault rifle bans or the odds of a black man dying of gun violence could be entirely different than in our reality. I apologize for those who came here looking for sources regarding this debate but you're probably better off checking a news site than a comic book and TV review blog for that sort of thing. Much like how we didn't realize how much we missed Paul Blackthorne until last week's episode, this episode makes us remember how awesome Willa Holland is as Thea Queen in all her snarky glory. Juliana Harkavy continues to impress as Dinah Drake. Her scene with Diggle here is a brief one but it's impressive how she and David Ramsey have built a strong relationship between the two on the basis of a few brief scenes over the last two episodes. Stephen Amell rarely gets to show strength to Oliver Queen's character outside of his Green Arrow persona. (And yes, there IS a difference between the two.) This episode shows us something of the Oliver Queen from the comics in Amell's performance - the rebel with a cause imagined by Dennis O'Neil who tried to be a man of peace yet found himself utilizing violence more often than he liked. While giving surprisingly little to do given all the subplots in this episode, the flashbacks to Wild Dog's past give the character some much needed development and Rick Gonzalez does a damn good job showing Rene Ramirez before tragedy changed him. The opening pre-logo scene, showing the shooter assembling his arsenal is well-shot and effectively blocked with quick fades to black and sinister music. The sequence with the active shooter is shockingly grim and realistic, with none of the over-the-top elements that occasionally filter into the larger-than-life fights on this show. This one is all the more powerful for how sedately it is directed and shot. The flashbacks to Rene's past seem to have a semi-sepia filter that put a subtle brown-red hue over the scenes. These scenes also seem to be more dimly lit - a stylistic choice that makes the scenes stand out all the more compared to the scenes set in the present. The script for this episode is one of Marc Guggenheim's strongest. He doesn't suggest any easy answers while tackling a serious issue in the proud Green Arrow tradition and presents a wide range of viewpoints and arguments without taking any sides beyond the general idea that we must do something regardless of where we fall on the freedom vs. security spectrum. The episode opens with a warning that this episode was rated TV-14 LV for mature themes, language and violence, which may not be suitable for all audiences members. While most Arrow episodes are rated TV-14, this warning was presumably added due to the realism of the active shooter scene. Coincidentally - given this episode's message regarding responsible gun ownership - it aired on the same day that the US Senate voted to repeal a law that made it illegal to sell guns to people with a history of mental illness. This episode shares its title with an episode of Star Trek: The Original Series. The plot of the Star Trek episode involved the members of a diplomatic away team being forced into a psychic illusion of Tombstone, Arizona pulled from Captain Kirk's mind. This episode reveals that Adrian Chase is a married man with a wife named Doris. In the original Vigilante comics, Doris Chase was the name of Adrian Chase's wife, whose death (along with those of his children) spurred his taking on the identity of Vigilante. Rene and Curtis quibble over the use of the terms "gun control" vs. "gun violence" and "assault weapon" vs. "rifle". These are frequent points of terminology conflict in real world debates on the issues of guns and gun safety. When describing the one apartment she liked that she looked at, Dinah mentions that it had a backyard garden. In the comics, Dinah Drake loved flowers and was a florist by trade. The pistol that Rene carries for personal protection in his civilian identity is a 9 mm. The gunman's primary weapon was an AR-15 firing 5.66 NATO rounds. Ollie: A lot to catch up on. Thea: Yeah. Like you and Susan Williams? Thea: People talk, Ollie. And uh, some people vomit a little. Laura: Woah. What do you think you're doing? Rene: Stadium's in The Glades, babe. In like the worst part of the worst part of town. Laura: So you're admitting you broke the rule? Rene: Kinda what I do, babe. Laura: The only reason I agreed to let you keep that thing in the house is because you said we needed it for home protection. Laura:As in, stays in the home. Now, hurry up. You guys are going to be late. Rene: I thought we were going as a family? Laura:(sighs) I have a headache. Rene: You taking something stronger than aspirin for that headache? Laura: You got something you want to say to me, Rene? Rene: I guess I do. (pauses) Are you using again? Thea: (To Rene) What were you doing with a gun in here? Rene: Judging by how I tagged the guy? I've got to go with saving people's lives. Curtis: This is military grade hardware! John: AR-15 assault weapon. It fires 5.56 NATO rounds. Curtis: It's an M16! It is -literally- the same gun as an M16! Felicity: Seems like some of Tobias Church's ordanance got into the wrong hand... wronger hands. Dinah: Not necessarily. It's an AR-15. It's available on the open market. (shrugs) In fact, it's the most popular gun in America. Curtis: (sarcastically) The Land of The Free and Home of The Incredibly Stupid. Felicity: We are not having this conversation, now or ever, guys. Quentin: Listen, I've been police most of my adult life. I should have been able to spot that guy 1000 yards out. Rene: Don't go there man, alright? What happened wasn't your fault. Quentin: I heard you got a few shots off. Rene: Yeah and I would have put him down, too, if he wasn't wearing body armor. Quentin: Listen - weren't you dishonorably discharged? Rene: (deadpan) Not for my aim, hoss. Quentin: My point is it's illegal for someone such as yourself to carry a firearm. Rene: But it's pretty easy to buy one, though. Curtis: I don't have any problem with your right to bear arms so long as it doesn't interfere with my right to - you know? - live! Rene: Are you kidding me?! Look at what we do, man! Our whole life is violence! Curtis: I'm not talking about what we do to protect the city! I'm talking about the fact that, as a black man, I am three times more likely to be killed by a gun than you! Quentin: He's got a point, Rene. Rene: Seriously?! You were a cop, man! Quentin: Yeah. And cops would kinda like it if there were less people out there with guns. Dinah: Not this cop. I mean, people have a right to protect themselves. Green Arrow: (drawing an arrow) Don't. Move. Vigilante: I'm doing you a favor! One less criminal on the streets! Green Arrow: Cold-blooded murder! You're the criminal! Vigilante: I'm you! The only difference between us is I use a more efficient weapon! Councilwoman: Yes, I'm against any registry that gives the government the opportunity to keep tabs on specific sectors of the population. Oliver: The DMV keeps a list of driver's licenses. Councilwoman: It's not a constitutional right to drive a car, Mr. Mayor. You know, people such as yourself oppose limitations on things like abortion, freedom of speech. Why is the Second Amendment somehow less important in your eyes than the other nine in The Bill of Rights? Oliver: Because people are dying, Councilwoman! Right here in this building! And there are limitations on abortion and freedom of speech. (pauses) Both my parents are dead. My friend Tommy was a... he was one of the 503 killed in The Undertaking. Laurel Lance was my friend. Nobody respects the rights of someone to protect themselves and the people that they care for more than me. But everything in life comes with limitations. Everything. Councilwoman: Why are you telling me this? Oliver: Because you and I are going to sit in this office until we figure out a reasonable set of limitations that respects everyone's rights. Dinah: You know? Just forget it. It's so stupid. John: Dinah, I work with Oliver Queen. Please try me. Curtis: We used to talk about things as a society, you know? We'd debate and we would argue and we would still respect each other after. Curtis: Rude? Yeah. It became impolitic to talk politics. I can't help but wondering that maybe that's why our country is the way it is today. Rene: Guns save lives. Period. Curtis: You just want to think that. Rene: No, that's what I know. Because if I'd had my gun, my wife would still be alive. Oliver: You had another chance to shoot me at City Hall. You didn't do it. Because you need me to enact the Star City Gun Registry. I mean, that's what all this is about, right? You want to punish the city because we failed to protect your family. Oliver: Mr. Edlund... I - I checked. The man who killed your family? He accquired those guns illegally. There's nothing that we could have done. No - no - no registry would have helped us protect them. Edlund: I know. I was supposed to protect them. Isn't that a man's job? To protect his family? Isn't that why we have guns?! My wife and daughters were innocent! Edlund: We're all angry! We're all so angry... all the time. So why shouldn't I use this?! Why shouldn't I kill everyone?! Put us all out of our damn misery?! Oliver: Mr. Edlund... that's not your call to make. Yeah, I mean, people are angry. And we're hurting. And we're lashing out. And I can understand that it feels like it's getting worse every day. But what you're doing is not the answer! The people that you hurt? The seven people that are dead? My friend... they were innocent too. Edlund:And I deserve to be punished. Oliver: Hey, Hey, Hey... Look, James. You've got to think about your wife and your daughters. Edlund: (sobbing) I -AM- thinking about them! Oliver: I know that you want this pain to go away. And I know that you want to be with your family again. But if you want them to live on? It has to be through you. That's the only way. Oliver: James. Give me the gun. Please? Dinah can hold her own in a fight against John, when he is armed with escrima sticks and she has a bo staff. Dinah's first undercover assignment as a cop was infiltrating a gang called The Pilgrims. It was here she learned how to use a bo staff. As of this episode, Dinah is living inside the old HIVE base in Star City - the same place John lived during his time on the run. Felicity tracks Claybourne's mistress (aka probably Prometheus' mother) to Illinois using information from The Pandora Cache. Rene Ramirez is officially hired on as the Deputy Mayor's Assistant. The gunman has a bag with a Forefather Repairs logo on it. The first result of the gunman's attack is five dead and 24 wounded, with 8 of the wounded in critical condition. DA Adrian Chase is one of the wounded. Rene's pistol is a 9 mm. The gunman's primary weapon was an AR-15 - a commercially available semi-automatic rifle. The gunman was skilled enough to avoid the security cameras until he had a mask on, has no prior record (or removed his fingerprints from the record) and apparently bought a workman's jumpsuit on-line so he could get into the building with a work bag unnoticed. Rene' and his wife, Laura, grew up in The Glades together. Laura was a drug addict. We don't hear what Rene did in the past but Laura says he has no room to judge her for being an addict. He says that for all he's done he's never done drugs. Two of the wounded in critical condition die on the operating table. We are told they were Kyle in commerce and Paula in accounting. Ollie suspects there will be another attack because if this was meant to be a one-time thing, the attacker wouldn't have bothered concealing his identity or have fled the scene of the crime. AR-15's are the weapon of choice for the Bertinelli crime family. Over 90% of their hits in the previous year used one. There are no national gun registration databases in the DCTVU. Felicity identifies the shooter as a 44 year old systems analyst with no prior criminal record named James Edlund. He was the married father of two daughters - 9 and 11 - until the Crosspoint Mall Shooting 16 months earlier, when his entire family was killed. The death tally of The Crosspoint Mall Shooting was 18 dead, 12 injured with one of them living as a quadriplegic. Edlund was a vocal proponent of a proposed local gun control ordinance called the SCGR - Star City Gun Registry. The previous city leadership stopped it from passing. Rene lost his wife after her drug dealer took her hostage at gun point in their home. While he was able to retrieve his gun and shoot the drug dealer, his wife died after the drug dealer's gun hit the floor and went off. His daughter Zoe was then taken away from him and put into foster care, with Rene being denied any visitation rights due to his home being an "unsafe environment". It is revealed that Rene was inspired to become a vigilante after seeing a news report about The Green Arrow killing Damien Darhk. He took the hockey mask and jersey that he wore to take his daughter to hockey games as his costume. The Star City hockey franchise is The Dogs. Curtis offers to have a lawyer friend help Rene get back custody of his daughter. Dinah moves into a studio apartment with a garden in the backyard and applies to join the SCPD. The City Council passes the Star City Firearms Freedom Act. It's surprising that it took Arrow this long to do a political story. It's even more surprising that it was done so well and in a way that didn't offer easy solutions or was entirely one-sided. More like this, please!